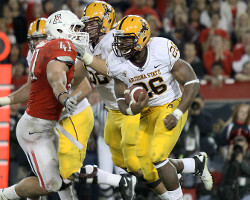 Arizona State junior defensive end James Brooks blocked a potential game-winning extra point, then blocked a would-be game-tying extra point to give the Sun Devils bowl eligibility and a 30-29 victory over Arizona in United States Sports Academy’s College Football Game of the Week. 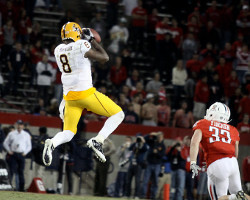 Visiting Arizona State rallied from an eight-point deficit in the fourth quarter, only to allow the Wildcats to march down the field for a tying touchdown, one point from ending the Sun Devils’ season. The 6-foot-5 Brooks came through when his team needed him most, sending a groan through Arizona Stadium and the game to overtime by high-jumping to get Luis Zendejas’ kick. After matching field goals by Zendejas and ASU’s Thomas Weber—his fifth—in the first overtime, Arizona State’s Cameron Marshall bulled his way through for a 2-yard score. 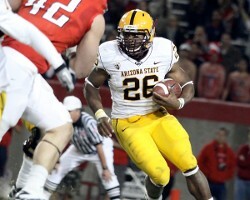 Arizona had a quick answer, with David Douglas taking a back pass in from 9 yards out. Just when the game seemed headed to a third overtime, Brooks sprang again, leaping up to get a chunk of another of Zendejas’ kicks, sending it wobbling just past the right upright.